Creating the right look for Halloween and other spooky themed events is one of those skills that every visual artist needs to have in their go to bag of tricks. There are lots of different techniques that can be used and in this guest tutorial we are joined once again by Colin Evoy Sebestyen for a demonstration of how to use a combination of LUT based FX, real-time video generators and logo images to create a retro horror film graphic scene in VDMX. In particular this look is inspired by intro sequences and color palettes from films like The Gate and more recently Stranger Things. Also a huge special thanks out Starrunner for providing the perfect soundtrack for this demonstration. Note: Colin has also created a set of free Halloween video loops in 4k and 1080p for you to download. For this example there are three basic steps. First collect all of the media files that are going to be used and add them to the VDMX project where they can be loaded onto layers. For this demonstration the media consists of a logo image and a few ISF generators such as this noise generator. In total there will be five layers: noise_matte, glow, graphics, bg and music. The 'music' layer is only used to playback a backing soundtrack and not needed if you are just doing visuals. Next, as the layers are added in the Workspace Inspector, individual FX are applied to adjust the visual styling such as VHS Glitching, Zooming Feedback, shaking, blurring and masking. The parameters of these FX and the ISF video generators themselves are then animated using LFO and Step Sequencer plugins. The final step is to create and load the LUT based FX that will be applied to adjust the color palette for the final output. When making your own LUT files you can use popular image editing softwares such as Adobe Photoshop and Affinity Photo to export .cube files which can be used in VDMX. Animate the controls of visual FX with Step Sequencers. Create your own LUTs from reference images in apps like Adobe Photoshop or Affinity Photo. 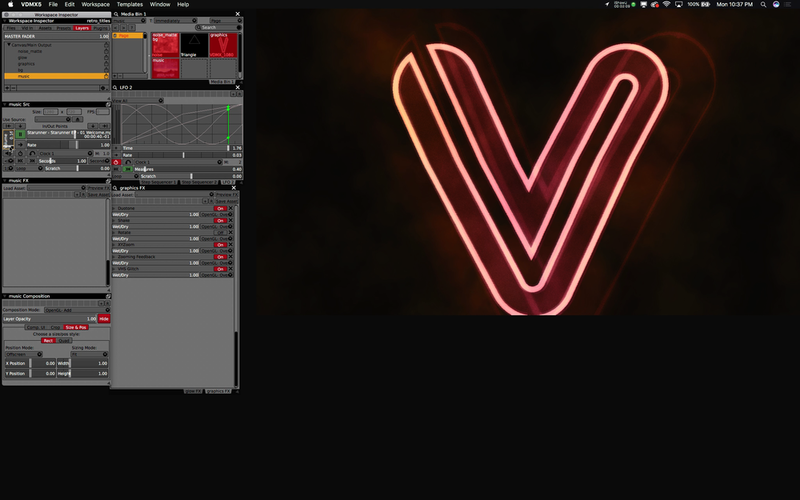 Install custom .cube LUT files into the VDMX assets folder.